A few more exhaust pieces have arrived at our Locost workshop, although not yet enough to build an entire exhaust system. Among the missing pieces is the muffler, which we think is sort of a key component. We could build an exhaust system without it, but it would be loud. We're not sure why it takes so long to ship this stuff. It's been weeks, and we have deadlines. Okay, not really, but still. We're thinking part of the problem, or maybe all of it, is that exhaust parts come under the close scrutiny of the California Air Resources Board, our state's own little uber-EPA. They know how much we car people love to bypass catalytic converters and all that other neat emissions control gear with our unrestricted mufflers and fancy custom exhaust pipes, so we believe they're watching everything that comes across the border from Nevada. All the exhaust parts we've bought so far have come with dire warnings about off-road use only. 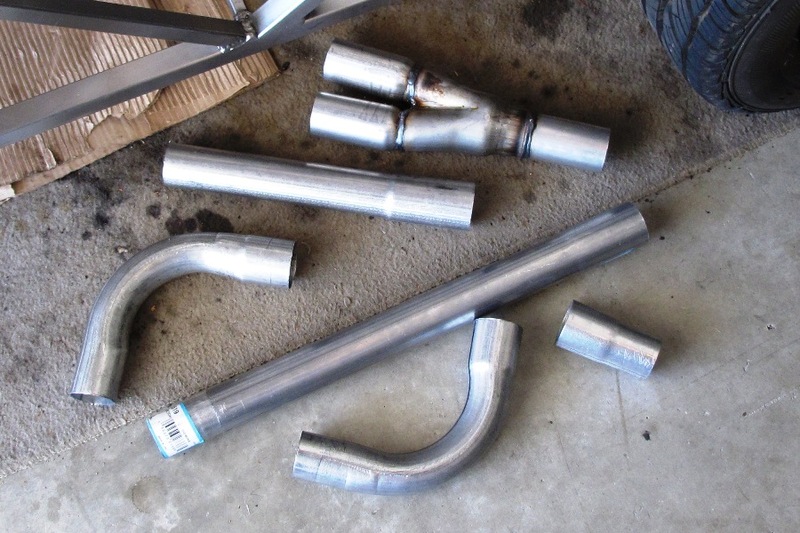 We have a theory that the company we bought the parts from, "Hilltop Bobsledding" (not its real name, changed to protect the innocent), has cleverly set things up so it doesn't appear as if a large quantity of rogue exhaust pipes have all gone to a single location. Unfortunately, despite their best efforts, I'm sure by now we've accumulated enough contraband to get on the CARB watch list, which unfortunately puts the exhaust system on hold until things cool down. 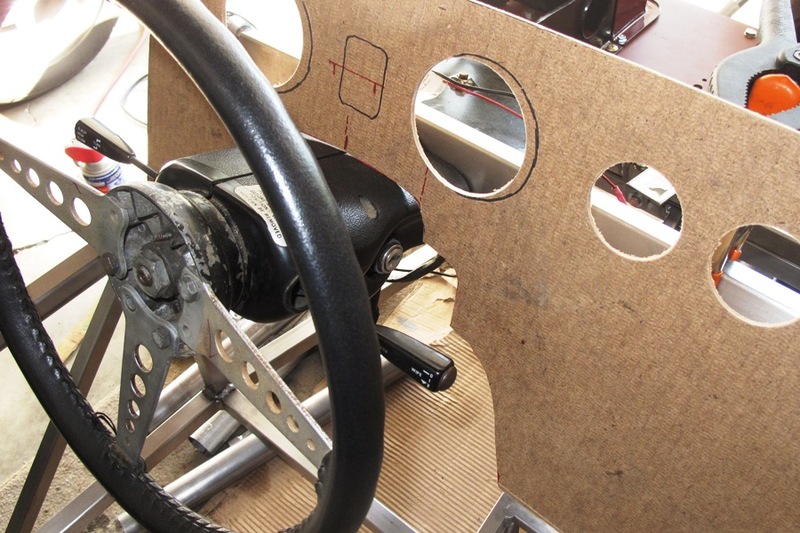 On the plus side, the exhaust delay allows us to move on to other fun stuff like for example the dashboard. The layout of the dashboard is probably the most important design decision any Locost builder can make. The reason is simple. These cars all look alike. To your average car enthusiast, you've seen one Locost, you've seen 'em all. The only thing that differentiates the cars, the only thing that makes one Locost look like a show car and another look like a transporter malfunction, is the dashboard. Build quality may also have something to do with it. Unfortunately, too many Locost builders don't seem to consider this when designing their dashboards. Iconoclasts by nature, Locost builders tend to eschew conventional dashboard wisdom in favor of something less ergonomic. They slap a big panel up there, drill a few holes, and stick in a couple of gauges according to their own aesthetic sensibilities. 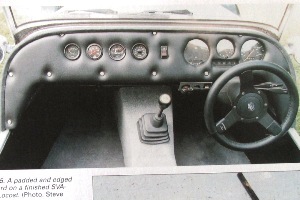 The typical result is a mixed bag of dials and switches clustered together in one small section the dash. The rest of the dash is sometimes left blank, and sometimes covered with fake carbon fiber. It's possible we're being overly critical. Again. In fairness, beauty, and even possibly ergonomics, is in the eye of the beholder, and the fact is, any dashboard in a running Locost is a good one, as long as you can see over it. And you avoid direct sunlight. And don't take a lot of photographs. Still, maybe you could run your design past your wife or girlfriend (or other, not to leave anyone out) before you start cutting up large sheets of metal. Before you design your Locost dashboard, you need to figure out what sort of materials you're going to make it out of. The book specifies aluminum (actually aluminium, but we're pretty sure that's the same thing), with some kind of foam padding and vinyl covering. 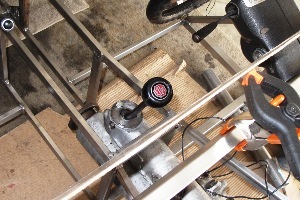 We're tempted to go with steel instead of aluminum, because we like steel and we can weld things to it, but we'll probably stick with aluminum because of this new weight-control thing we've got going. As for the rest of the book design, we're not huge fans of foam padding. Or vinyl. At one time we thought about using wood, but wood is thick and possibly not strong enough for those occasions when we're stuck behind some idiot in a Prius and need something to pound on. 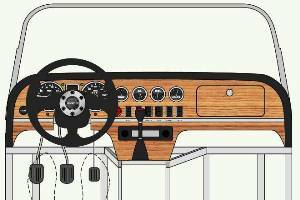 Still, we feel a car of this era deserves a wood dash, so even if we make the panel out of aluminum or steel, we'll probably cover it with a nice oak or walnut veneer. So long as it looks like real wood and not wood grain shelf paper. Although you could do worse than wood grain shelf paper. Although not much. Because we're not one hundred percent sure what materials we're going to use to make the dashboard, we can't actually build it yet, but we were able to put together a mock up. To do this we blew up our PowerPoint dashboard design to life size, then printed it out on several sheets of paper and taped it all to a big piece of pressboard. 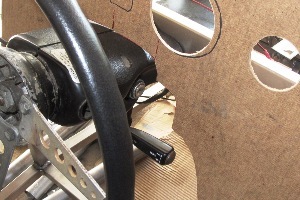 We then cut out the basic outline with our scroll saw, and started to cut out holes for all of the instruments and switches, but then we quickly lost patience and stuck the thing on the car to see if it would fit. Close enough. 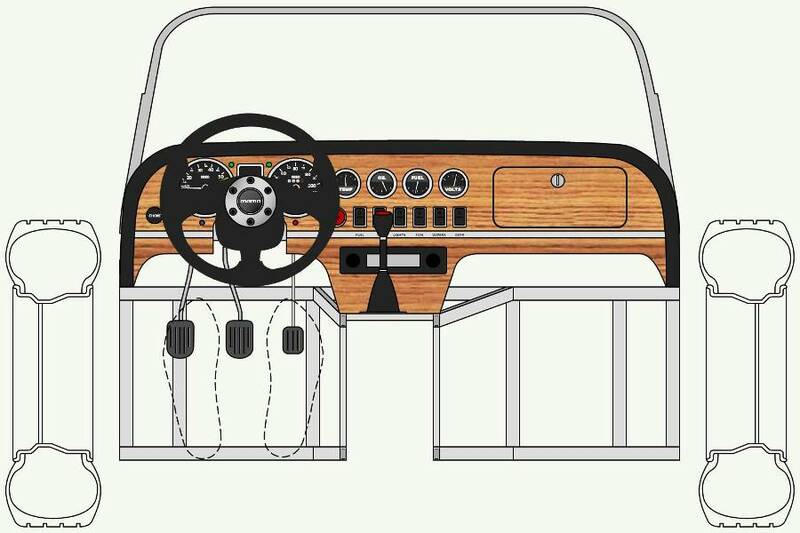 One thing we realized while we were working on the design is that the dash was going to be closer to stuff in the Locost than it was in the M.G. 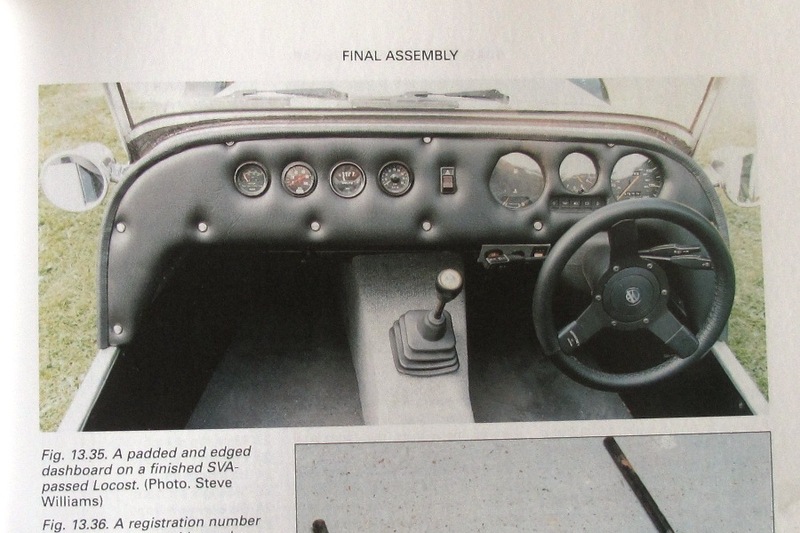 We were pretty sure the dashboard would go right down the middle of the ignition switch, blocking it off completely, and we were also concerned there wouldn't be enough clearance between the dash and the shift lever in first or third gears. It turns out we were right about the ignition switch. We had to cut away the dash around the switch to give us enough room to turn the key. 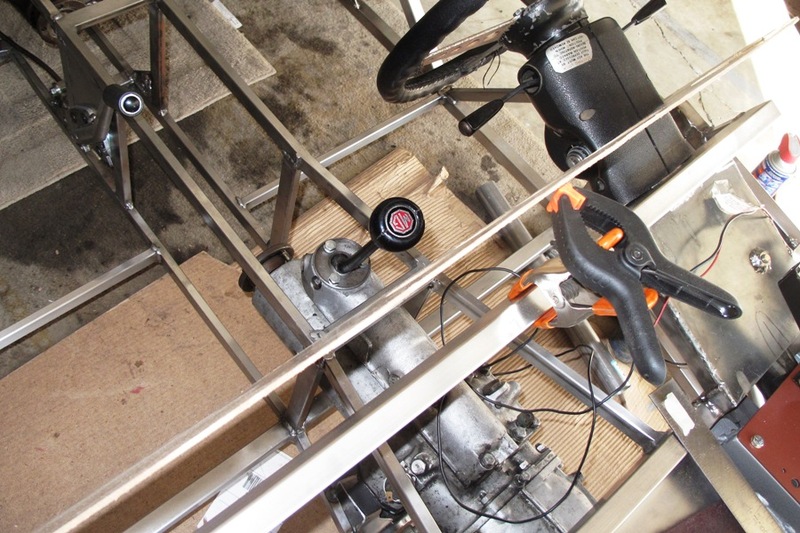 It doesn't look too bad with the stock MGB steering cover in place. 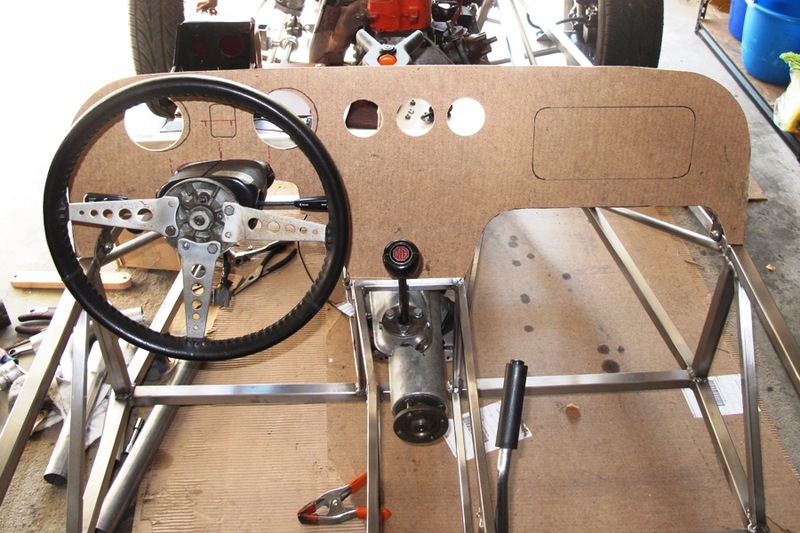 In our PowerPoint sketches, we only had an inch of clearance between the dash and the shift lever. We of course expected the sketches to be a little off, and of course in our favor, and once again they proved to be exactly right. So we only have an inch of clearance between the dash and the shift lever. We sat in the car and tried a few quick shifts, and there seems to be enough room for normal shifting, although probably not all of our shifts will fall into the normal category. If it gets to be a problem, I'm sure we can find a way to bend the lever slightly. Having recently denigrated the vast majority of Locost dashboard designs, we've decided not to claim that ours is any better, although we did run it past the wife and girlfriend. We think our design is okay, clean and simple, with everything visible and everything within easy reach. We'll probably move the speedometer and tach a little closer together, otherwise we're happy with it. And of course it'll look a lot better when the car is running. I absolutely love your blog and find almost all of your post’s to be exactly I’m looking for. can you offer guest writers to write content in your case? I wond2ul17;t mind creating a post or elaborating on a few of the subjects you write concerning here. Again, awesome blog!